I’ve fancied making homemade chocolate mousse for a long time, but the thought of making an egg based version has never appealed to me. Many chocolate mousse recipes call for raw or barely cooked eggs to be used to provide silkiness to the mousse, but I can’t stomach the idea of eating raw eggs. However, I’ve heard that vegans frequently use tofu to create a smooth chocolate mousse, so when I was in the supermarket I picked up a pack of plain tofu so I could give it a go. Silken tofu is a high FODMAP ingredient so don’t use that form of tofu to make this pudding, but as long as you only use either plain or firm tofu this recipe remains low FODMAP. In order to make a super smooth chocolate mousse I’d recommend using a food processor or NutriBullet because they whip the ingredients together and ensure a really creamy result, but if you don’t have either of these just mix it very thoroughly in a large bowl and it will be fine. 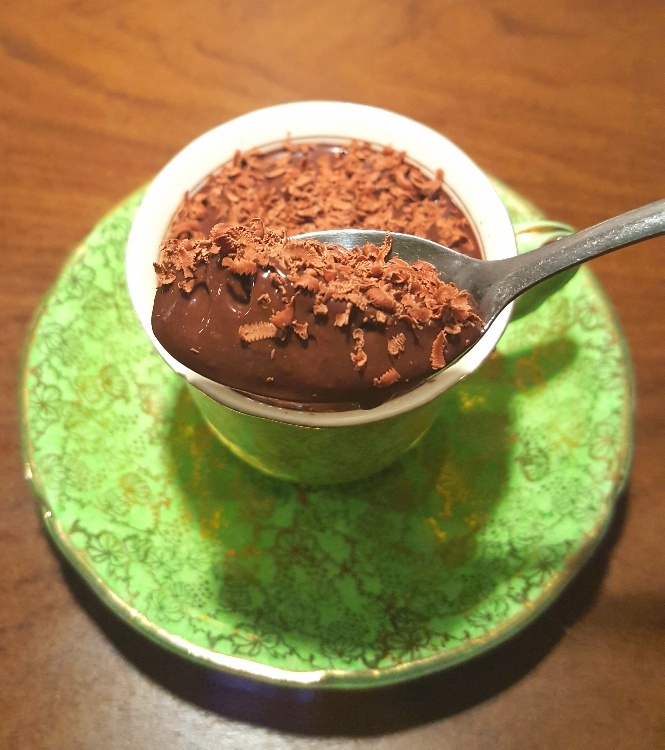 This chocolate mousse is really rich, so I’d recommend making 6 small portions. 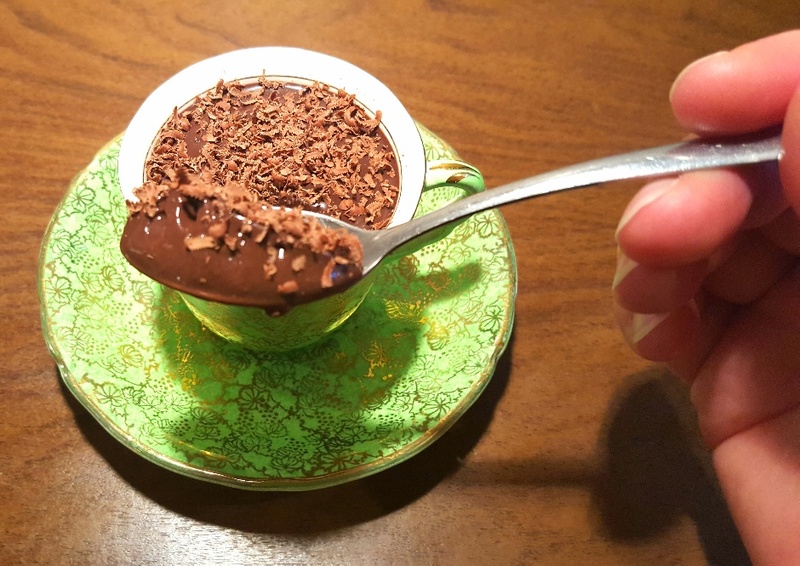 In fact, the little green cup you see in the photograph is actually an espresso cup, but it makes the perfect portion size for these chocolate mousses because I think a larger portion would be too much. I’m really tempted to add 1/2 a teaspoon of ground ginger or cinnamon next time I make these (and it won’t be long until I do!) because I think it would really enhance the chocolate flavour of the mousse. It would also be lovely served with some delicate biscuits on the side, such as little pieces of shortbread. Overall, this chocolate mousse is a seriously rich and wonderfully light dairy-free chocolate pudding that will fool anyone who thinks it’s made with eggs or cream. It’s the ideal little treat to end a meal with. Have 6 ramekins or small serving dishes to hand. Place all of the ingredients in your food processor or NutriBullet and pulse until it forms a smooth liquid. If you don’t have either then just whip it by hand in a large bowl. Pour the mixture into your ramekins and put them in the fridge to set for at least half an hour before serving.